It’s time to dream big! Your wedding day is an important one, and for the day to go smoothly, it involves months of detailed planning and decisions. From alterations and florals to tastings and rehearsals, the wedding planning process is one that some can approach with grace, and some can’t help but let it turn them into bridezillas/groomzillas! So while you can do it all yourself, having a team of experts to help execute your dream wedding can save a lot of headache and stress. 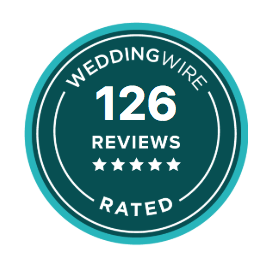 One of the benefits of having been in the business for over 20 years, is that we’ve established some amazing partnerships and worked collaboratively with the best wedding teams in Colorado. We know all the ins and outs and want to share them with you! For this post, we’ve reached out to some of our partners to reveal some pieces of wedding planning advice that will help you enjoy a stress-free celebration. Picking your wedding venue should be one of the first items you check off your wedding planning checklist. This decision will influence many factors down the line so it’s important to have this detail confirmed. Whether you’re looking for a traditional venue or something more ‘alternative’, make sure the location is representative of you and your story. While doing your venue research, our friends at the Boettcher Mansion recommended to always look at and pick from the list of preferred caterers. A big portion of your wedding reception is the food. Picking the right caterer and the right food to serve can be slightly daunting when keeping things like dietary restrictions, the number of guests and a budget in mind. Here at Relish, we believe that you should meet and get to know your wedding caterer’s process and understand the way they work. This is also a great opportunity to follow up with other questions that will help put timelines into perspective and sort out smaller details. When it comes to flowers, Plum Sage Flowers recommends to always make it personal and make it your own. In an era where it is very easy to look for inspiration in other channels like Instagram or Pinterest, it is important to do what feels right to you and not what you think your special day should look like by recreating someone else’s. Sometimes you’ve just got to let the experts do their jobs! Brides, Bumps & Babies Photography has a reminder to politely ask all wedding guests to please put away all phones, iPads and even pro cameras away during the time of the ceremony to avoid ruining professional grade photos. This moment only happens once so why not sit back and enjoy the show! We all have that relative who has a few too many drinks at family gatherings and becomes the light of the party. How do you account for this and take the other guests into consideration? Alcohol portioning is tricky business – especially when you want everyone to have fun and be conscious of your budget. Our alcohol calculator will be able to give you an idea of how much to account for! When it comes to spicing up a party, Mondo Vino knows how to do it right! Transportation is often the item that gets overlooked and ends up towards the bottom of the list. The sooner you can book your venue and hotels, the sooner you can turn to Hermes Worldwide to accommodate any transportation needs! There will always be details that will be uncertain such as guest count, but these can be filled in later. As you see, takes a team to execute a dream wedding – the more time you give yourself to build your team and flesh out all the details, the easier it will be to keep things stress-free and manageable. We believe in building relationships with all the couples we work with – this bond is what allows us to do great work. We speak on behalf of our partners when we say that being able to be part of your journey brings us all the joy in the world and motivates us to keep doing what we do. If you’re looking to get started with your wedding planning process, don’t hesitate to give us a call at 303.532.4095 or send us a message! We’d love to learn more about your wedding ideas and schedule a tasting catered to your needs.